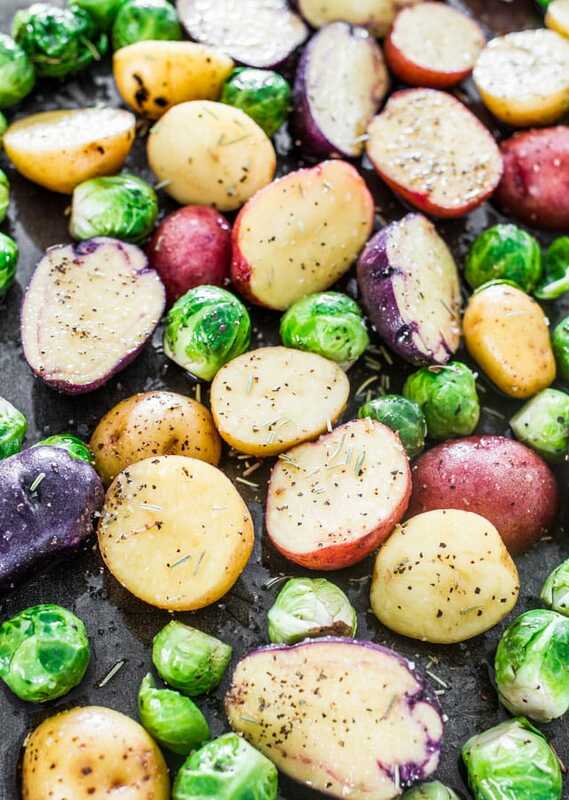 Rosemary Balsamic Baby Potatoes and Brussels Sprouts oven roasted to perfection, a simple, yet elegant and delicious side dish. I’m the type of person that was never a big fan of brussels sprouts. After all, they’re little cabbages, what’s to love? But then something magical happened. One day while grocery shopping, these brussels sprouts stared back at me. There they were all cute and green and just dared me to buy them. So I did. I cooked them the only way I could think of, my most favorite way to eat vegetables. I roasted them with a bit of olive oil and balsamic vinegar. Well that was the end of the old me. The new me now loves roasted brussels sprouts. They are delicious, they pack a lot of flavor in those little bodies of theirs. I’ve made them before roasted and tossed them with crumbled bacon, I can’t tell you how good they are that way because, well bacon does make everything taste better. But this time I roasted them with these gorgeous baby potatoes I found at the grocery store, 3 different colors. I lightly drizzled them with a bit of olive oil, some balsamic vinegar, seasoned them generously with salt and pepper and some dried rosemary. 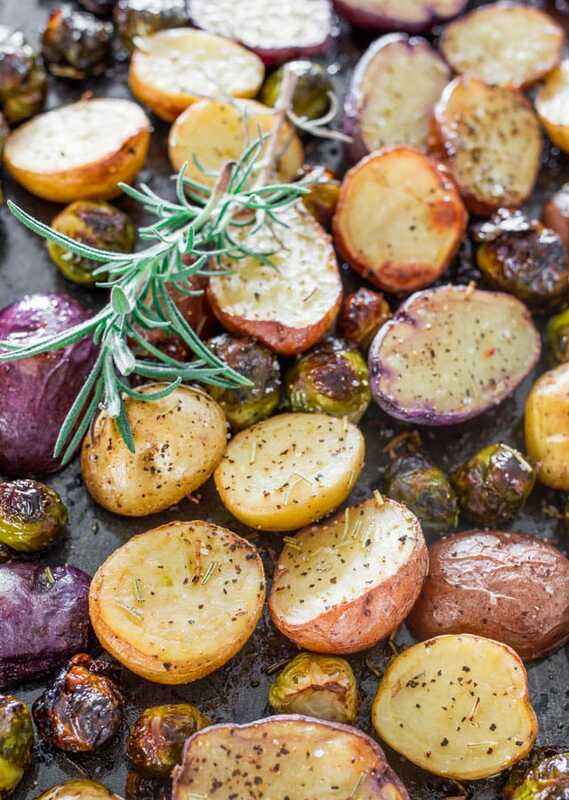 Rosemary is an herb I don’t think we use enough of, but I just love the smell of it and the flavor it gives to these roasted potatoes and brussels sprouts. 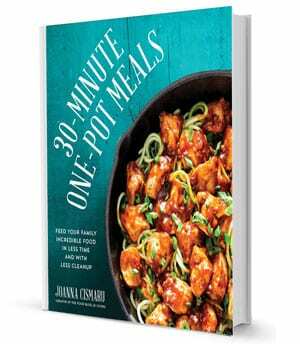 This is my ideal side dish, it would pair perfectly with some pork tenderloin or as a side to a nicely roasted chicken. I sometimes even just eat this on it’s own, sometimes I’ll throw in other veggies, like peppers and tomatoes, oh how I love roasted tomatoes. But I leave it up to you to experiment with the veggies of your choice, like broccoli, cauliflower, carrots, mushrooms, possibilities are endless. Cut off the ends of the brussels sprouts and cut them in half. Cut the baby potatoes in half. Wash the brussels sprouts and potatoes and put in a big bowl. Drizzle the olive oil and balsamic pepper of the potatoes and brussels sprouts. Season with salt and pepper and add rosemary. Toss the potatoes well. 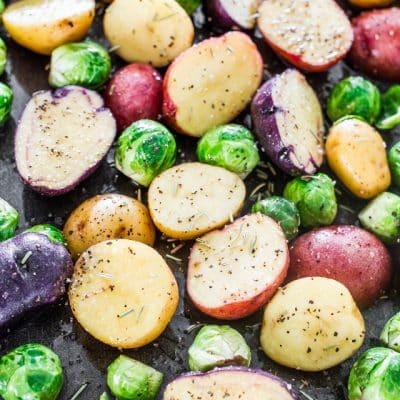 Place potatoes and brussels sprouts on a baking sheet and bake for about 30 to 40 minutes or until potatoes are done and golden. Made these last night, very delicious, very easy and very pretty!